I was REALLY wanting to love this! I really was! But it just missed the mark for me. The packaging is AMAZING. It is a really pretty soft and matte grey. It has a rubber like finish to it. It is a sturdy plastic and has a magnetic closure with a button release clasp. So it is shut! I love it. There is no variety. 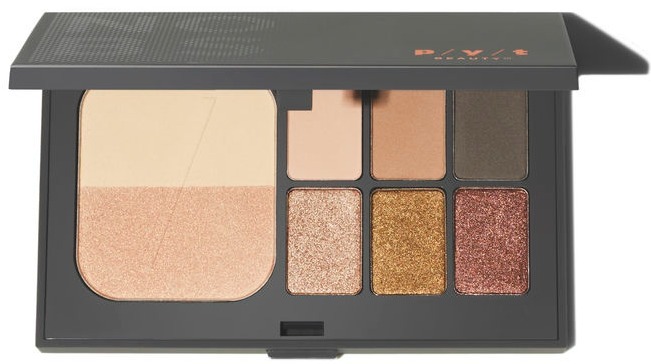 It is literally this one palette. I am sure that this line will have more options in the future, but for now this is it. I thought the option, for it being the only one was really simple and very neutral. But After getting it, the shades in the palette are not true to the colors online. The top matte shades are accurate but the bottom shimmer shades are not. The middle shade appears to be medium golden tan. and the the furthermost to the right looks like a soft medium cool toned brown. However in reality the middle shade is more of a forest green, while the other shade is more of a truffle purple. The shades had initial pigment that was pretty nice. Not mind blowing, but decent. Better than your average drugstore brand. I also didn't have hardly any fallout from this product. But the wear was just not there. Even with my best and fanciest primers, the shadows just did not stay in place. The pigment faded throughout the day dramatically and the shadow is prone to creasing (even with my crease-less primers). It just misses the mark for me.